Nicolas Noxon is the recipient of the 2009 International Documentary Association Pioneer Award, which is presented annually to an individual who has made an indelible impression on the evolving art and craft of nonfiction filmmaking. Noxon has written, produced and directed more than 40 television documentary specials and series and supervised many more. During his long association with the National Geographic Specials, he and his team have won 58 Emmys, beginning, for Noxon, with a 1978 Best Documentary Emmy for the PBS Special The Great Whales. Noxon won IDA Awards as executive producer in 1998 for America's Endangered Species: Don't Say Goodbye and in 1999 for The Dragons of Galapagos. He has also won two George Foster Peabody Awards and numerous international honors. The story about why and how he got involved in producing and writing documentaries, and about his experiences, are like the script for a feel-good Hollywood movie. Noxon was born in London in 1936. His mother, Betty Lane, was an American who had a talent for painting. His Canadian father, Gerald Noxon, was a writer, mainly for radio. His parents sent him to the US during the early days of World War II, and they subsequently followed. His father founded the film school at Boston University in 1948. After his parents were divorced, his mother taught art at a private school in Connecticut. "I loved movies when I was a kid," Noxon recalls. "It only cost 12 cents to see matinees in theaters. I never missed John Wayne Westerns." Noxon attended Putney, a high school in Vermont, and went on to Antioch College in Ohio, where he was a student in a five-year work-study filmmaking program. "Filmmaking, especially documentaries, came naturally to me," he says. "I worked in the Antioch audiovisual department, mainly on 16mm educational films. After college, I was an editor and writer for an educational film company in Washington, DC. It was wonderful experience, but I soon realized that Washington was not the place for more ambitious work or TV." In 1960, he intuitively quit his job and drove to Los Angeles. Someone there told him that David Wolper was planning to produce a documentary series for syndication. Wolper had just produced his first documentary, Race for Space, and syndicated it to 109 TV stations, bypassing the networks. "I thought that was revolutionary," Noxon says. He joined Wolper Productions and was there through 1966, writing and producing documentaries for the Biography and Men in Crisis series and various other projects. The Biography series was hosted by Mike Wallace. Noxon wrote and produced documentaries about Winston Churchill, Amelia Earhart, Thomas Edison, Henry Ford, Clarence Darrow, Teddy Roosevelt and FDR. His Men in Crisis documentaries included Wets vs. Drys, which focused on the American experience with prohibition during the 1920s, and Roosevelt vs. Isolation, a crucial issue during FDR's administration. The Biography and Men in Crisis documentaries were enlightening and compelling history lessons as well as entertainment. Noxon also worked with Wolper on Hollywood and the Stars, Hollywood Goes to War and The Great Directors series. "Top directors were happy to allow us to film interviews with them because they were taken much less seriously by the public than they are today," he recalls. That was during the days when documentaries were produced on 16mm black-and-white reversal film with a Nagra recorder to capture synchronized sound. Noxon moved on to explore new territory after Wolper sold his company. The documentaries that he helped to create there will be accessible for posterity, because Wolper arranged for the Academy of Motion Picture Arts and Sciences to archive all his productions. In 1967, Noxon and Irwin Rosten organized the documentary department at MGM Studios. Their first venture was a 1968 documentary about the legendary actor Clark Gable, who died in 1960. The documentary was a seamless blend of archival footage, interviews with people who crossed paths with Gable and a narration by Clark's friend Burgess Meredith. After MGM, Noxon continued his periodic relationship with National Geographic, which had been one of his earliest ambitions. "Back when I was working in Washington, my office was two blocks away from National Geographic headquarters." Noxon explains. "I got to know a lot of people who worked for them. I tried to talk them into starting an educational film company, using still photographs and articles from their magazine, but I was thinking too small." When National Geographic approached Wolper in Hollywood to produce television documentaries, he brought in Noxon, who wrote and produced three of the first National Geographic documentaries, which aired on the CBS television network. Subsequent programs continued on commercial networks, but a quantum leap forward came when Gulf Oil agreed to finance and aggressively promote National Geographic documentaries through WQED, the PBS affiliate in Pittsburgh. That was the beginning of the epic run of National Geographic Specials, which attracted record-setting audiences for PBS. Noxon subsequently became executive producer and head of the National Geographic West Coast production facility. Projects he supervised included Wolves of the Sea and The Dragons of Galapagos, which won Golden Panda Awards at the Wildscreen Film Festival. He also supervised production of Heroes of the High Frontier, which won an Emmy Award for Best Informational or Cultural Special in 1999-2000. Noxon has many fond memories of various other projects that he wrote and produced for National Geographic, including Secrets of the Titanic (1986), the most popular and commercially successful project of his career. "I was on the ground floor with that one," Noxon recalls. "I had known Bob Ballard, the oceanographer who initiated this project, for years. 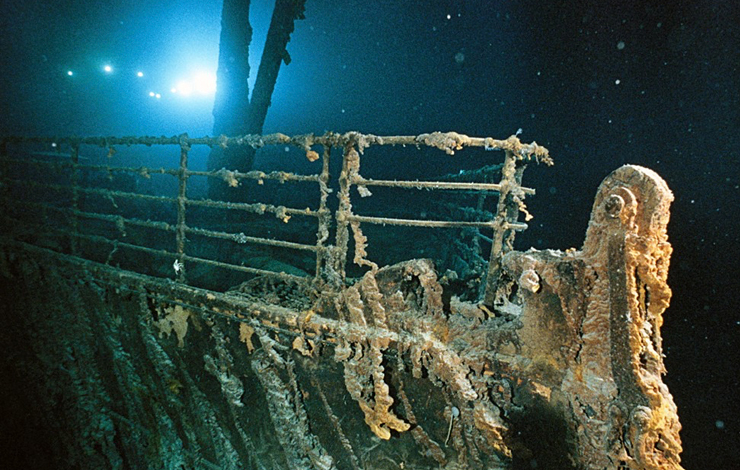 We had a compelling interest in the Titanic. But we had no idea how interested other people would be. I was shopping in a music store around Christmas time the year the documentary came out; I saw a group of people gathered around a big pile of Secrets of the Titanic videocassettes. That's when I realized the huge implications of people being able to buy and watch documentaries at their leisure as often as they liked. It changed everything and opened all documentaries to much greater and more diverse audiences." When we asked Noxon what advice he has for aspiring documentarians, he replied without pausing, "Join IDA, go to every event and meet people who can give you advice and the chance to gain experience. Thanks to cable, there are many more hours of television open to documentaries today. And a world that celebrates Ken Burns, Michael Moore, Robby Kenner and Antarctic penguins is diverse and full of opportunity." And stay tuned. The last chapter in this story hasn't been written yet. Noxon is currently writing a book about his mother, which is primarily based on "her fascinating journals. She was a prolific writer and talented artist. It's much like a compilation film; I guess we're coming full circle."